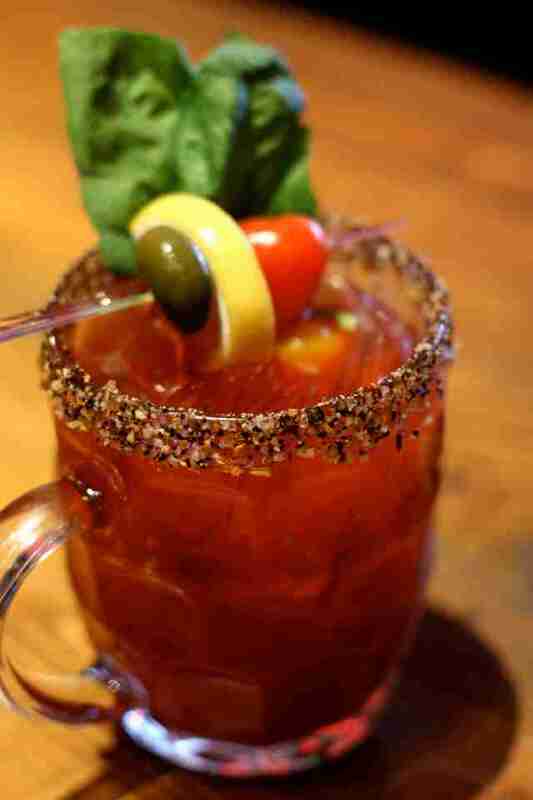 The Bloody Caesar is a hangover cure that was invented in Calgary, after a hotel manager was asked to create a drink for a new Italian restaurant, and apparently thought to himself "There's not nearly enough seafood in booze these days." Since that creative day in 1969, Canadians have been knocking back an estimated 350 million Caesars every year -- and some of the finest are served at these 10 venerable institutions. 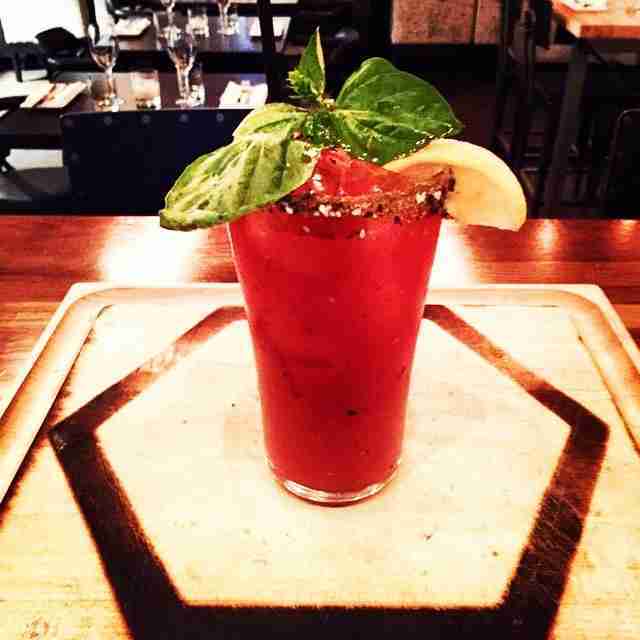 Winner of the 2014 Best Bloody Caesar in Town from Mott’s Clamato, La Champagnerie’s Bloody Cesar is one to beat. 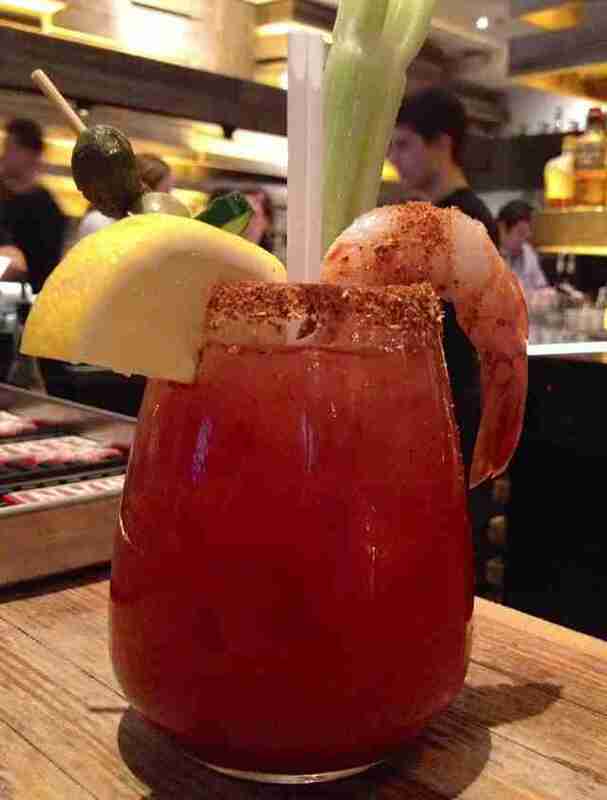 It's made with celery salt, vodka, lemon, chipotle Tabasco, and bitter Sriracha and is accompanied with a juicy tiger shrimp and an oyster, while its Bloody Craby is made with Walter Caesar mix, orange Grey Goose, bitters made of habaneros, and cranberries. Not sold yet? It comes with soft-shell crab tempura. Along with beautifully plated dishes and cappuccino artwork, Les Enfants Terribles has a Brazilian Bloody Caesar that should be on everyone’s list/in everyone's bellies. It is made of fresh chilies, a homemade Caesar mix, steak spices, Cachaça -- a Brazilian spirit made of sugarcane -- and garnished with a jumbo shrimp. 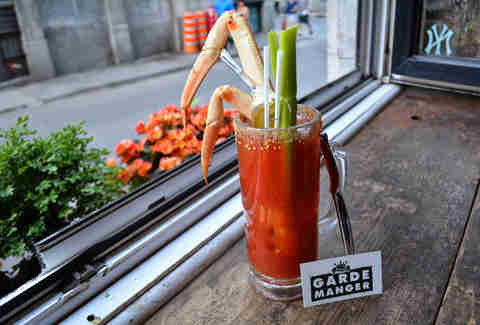 Garde Manger, owned and operated by celebrity chef Chuck Hughes, has a Bloody Caesar that is thicker and spicier than most. It blends vodka, Montreal steak spice (roasted in-house), celery root puree, horseradish, Tabasco, and Worcestershire sauce. And because Hughes is obsessed with fresh seafood (he has a lobster tattoo), it should come as no surprise that his Bloody comes with a huge crab leg. Are you in the mood for raw seafood? Would you like booze with it? 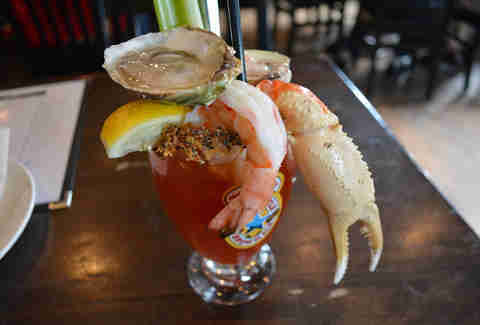 Try Lucille’s Seafood Bloody Caesar: it's an appetizer and a cocktail in one! 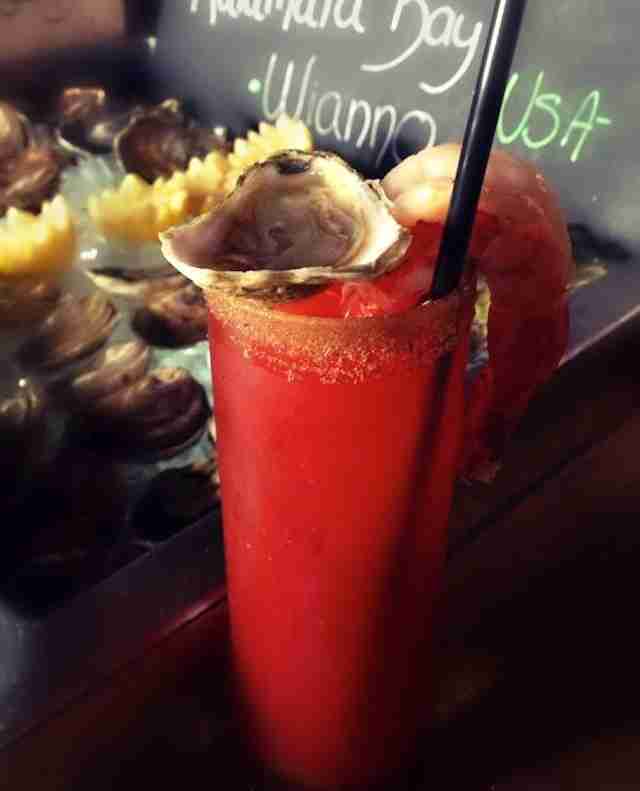 The drink comes with a crab leg, an oyster, a clam, and a jumbo shrimp. Cold? 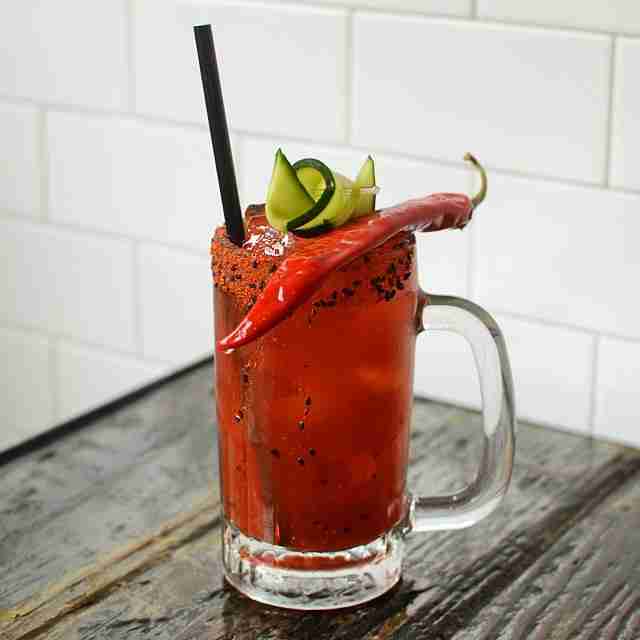 What could keep you warmer than double the quantity of vodka and a full-sized chili pepper? Along with the comically large pepper, it includes horseradish, steak spice, Worcestershire sauce, Tabasco, and is garnished with dill, olives, and a gherkin pickle. Vegetables, as we all know, always taste better with a double shot of vodka. 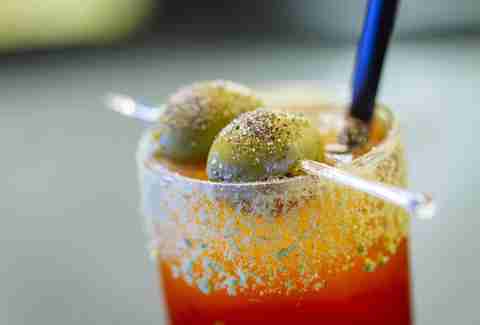 Le Gros Luxe’s menu contains seven Bloody Caesars, so picking one is difficult. But you gotta go big or go home, so the winner is L’Gros Caesar. The vodka-based cocktail comes with a full meal on sticks that stand proudly inside your drink. 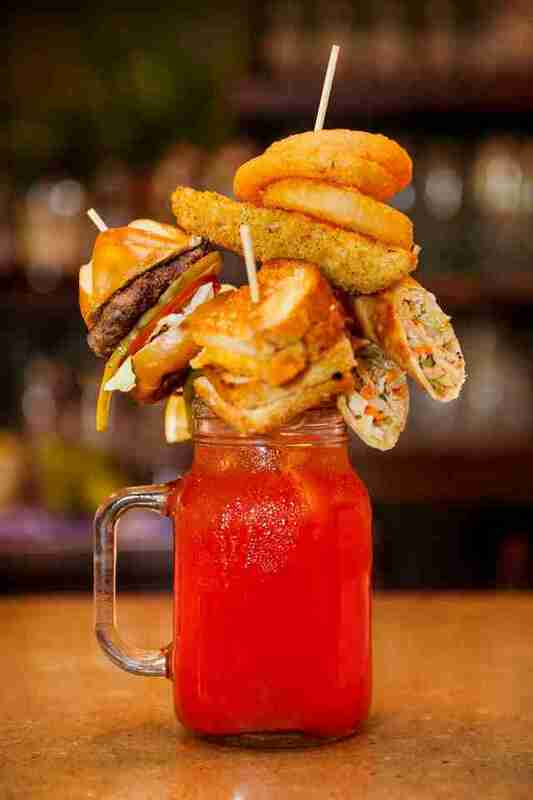 The drink’s garnishes are a grilled cheese, a fried pickle, onion rings, a mini burger, and spring rolls. Le Saloon has two tasty Bloody Caesar cocktails: its Saloon César is a fresh and citrusy concoction made with lemon-flavored vodka, fresh basil, balsamic reduction, olives, and cherry tomatoes. If you want to go classy, however, order the Bloody Pickle Martini. Made of gin, Jameson, pickle juice, celery salt, and Worcestershire sauce, this martini takes the working man’s Bloody Caesar up several levels. 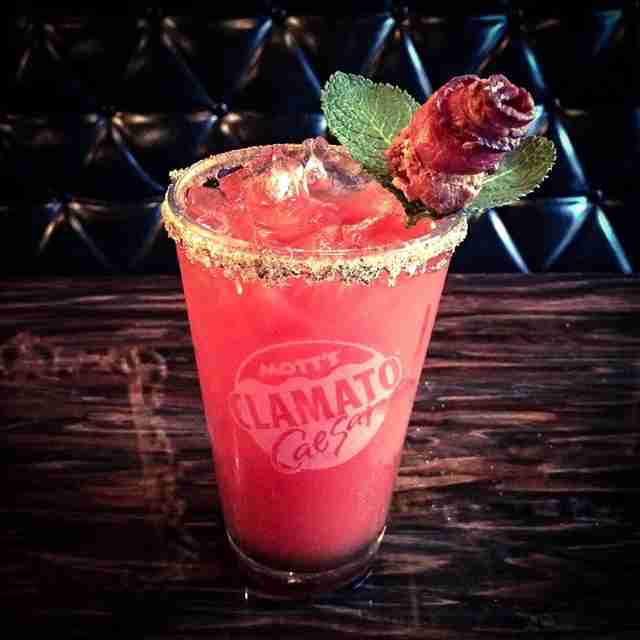 Montreal’s all-bacon bar Brutus has a Bloody Caesar. Yes, it has bacon. In fact, it's topped with a bacon rose. What should you pair with it? Try the Brutus PLT: a pretzel sandwich with lettuce, tomatoes, and bacon, or go for Brutus' Jäger Poutine. We’ve saved the best for last. 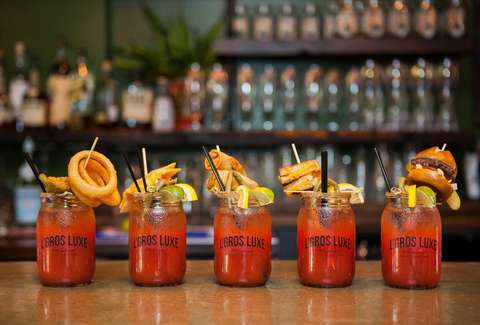 Le Slang’s Smokin’ Caesar includes a Worcestershire sauce that has been infused with five-times-smoked bacon and olive brine. But its Basil Sesame Caesar blends sesame oil, sweet basil caviar, and sambal. Glorious.